"The Raising of Lazarus" redirects here. 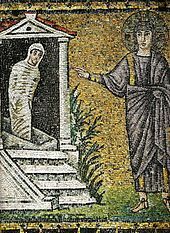 For other uses, see The Raising of Lazarus (disambiguation). The raising of Lazarus or the resurrection of Lazarus is a miracle of Jesus recounted only in the Gospel of John (John 11:1–44) in which Jesus brings Lazarus of Bethany back to life four days after his burial. In John, this is the last of the miracles that Jesus performs before the Passion and his own resurrection. Lazarus is the brother of Martha and Mary of Bethany. The family lives in the village of Bethany, about two miles east of Jerusalem on the south-eastern slope of the Mount of Olives. According to John 11:1-44, Jesus receives a message that Lazarus is ill, and his two sisters are seeking his help. Jesus tells his followers: "This sickness will not end in death. No, it is for God's glory so that God's Son may be glorified through it." Jesus then delays his departure and leaves after two days. The disciples are afraid of returning to Judea, but Jesus says: "Our friend Lazarus is asleep, but I am going to awaken him." When the apostles misunderstand, he clarifies, "Lazarus is dead, and for your sake I am glad I was not there, so that you may believe." When they arrive in Bethany, Lazarus has been dead and buried for four days. 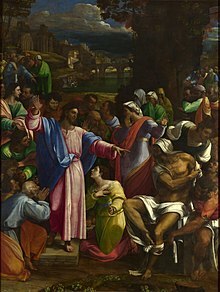 Before they enter the town, Martha, Lazarus' sister, comes to meet Jesus and tells him: "if you had been here, my brother would not have died". Jesus assures Martha that her brother will rise again and states: "I am the resurrection and the life. He who believes in me will live, even though he dies; and whoever lives and believes in me will never die. Do you believe this?" Martha affirms that she does truly believe and states, "Yes, Lord. I believe that you are the Messiah, the Son of God, who has to come into the world." This is only the second time (after Nathanael) that someone declares Jesus as Son of God and the first time someone equates him as 'Messiah' and 'Son of God' together. The only other time this happens in the entire gospel is in the explanation the author of the Gospel gives for writing his Gospel at the very end. Upon entering the village, Jesus is met by Mary and the people who have come to console her. Upon seeing their grief and weeping, Jesus is deeply moved. Then, after asking where he was buried, the shortest verse in the four Gospels, and the entire Bible, is found - "Jesus wept". After that, Jesus asks for the stone of the grave to be removed, but Martha interjects that there will be a smell. To which Jesus responds, "Did I not tell you that if you believed, you would see the glory of God?" They take the stone away then Jesus looks up and says: "Father, I thank you that you have heard me. I knew that you always hear me, but I said this for the benefit of the people standing here, that they may believe that you sent me." When he said this, he then calls in a loud voice, "Lazarus, come forth!" The dead man comes out, his hands and feet wrapped with strips of linen, and a cloth around his face. Jesus says to them, "Take off the grave clothes and let him go." Lazarus is mentioned again in the Gospel of John chapter 12. Six days before the Passover on which Jesus is crucified, Jesus returns to Bethany and Lazarus attends a supper that Martha, his sister, serves. Jesus and Lazarus together attract the attention of many Jews and the narrator states that the chief priests consider having Lazarus put to death because so many people have come to believe in Jesus on account of his raising Lazarus. The miracle of the raising of Lazarus is the climax of John's "signs". It explains the crowds seeking Jesus on Palm Sunday, and leads directly to the decision of Caiaphas and the Sanhedrin to plan to kill Jesus. 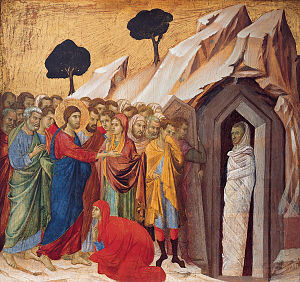 Theologians Moloney and Harrington view the raising of Lazarus as a "pivotal miracle" which starts the chain of events that leads to the Crucifixion of Jesus. They consider it as a "resurrection that will lead to death", in that the raising of Lazarus will lead to the death of Jesus, the Son of God, in Jerusalem which will reveal the Glory of God. Calvin notes that "not only did Christ give a remarkable proof of his Divine power in raising Lazarus, but he likewise placed before our eyes a lively image of our future resurrection." In Fyodor Dostoevsky's 1866 novel Crime and Punishment the murderer Raskolnikov asks the prostitute Sonia to read him this section of the Gospel. ^ "John 11:1-46". Biblegateway. NIV. ^ Clowes, John (1817). The Miracles of Jesus Christ. Manchester, UK. p. 274. ^ "John 11 Calvin's Commentaries". Biblehub.com. Retrieved 2018-04-16.